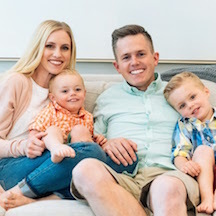 Ellie and Jared Mecham are popular YouTube vloggers. They started their YouTube channel in October 2011 chronicling their journey with infertility and her diagnosis with PCOS (Polycystic Ovarian Syndrome). Their first son was delivered with fertility treatments; their second son came as a surprise without medical help. After suffering two miscarriages, they are expecting a third son in June 2018. Their channel has almost 1.5 million subscribers and over 500 million views. Ellie's family members are also vloggers, including Chad and Jennifer Griffiths, Beau Griffiths, Bonnie Hoellein, Ruby Franke, and Julie Deru. Ellie and Jared are members of The Church of Jesus Christ of Latter-day Saints. This page was last edited on 14 December 2018, at 16:05.